Aero Conditioner Company offers five basic models of roof-mount harsh-duty air conditioners ranging in cooling capacity from 12,000 BTUH (3.5 KW or 1 ton) through 36,000 BTUH (10.6 KW or 3 tons) when measured. Aero Conditioner Company rates these capacities at and designs the air conditioners for ambient temperatures of 131°F (55°C), not the normal rating temperatures of 95°F (35°C) used by most manufacturers. Since Aero's patented design assures that air conditioners will maintain their full cooling capacities at lower temperatures without fan speed or other active controls, we assure that units can deliver the promised cooling throughout the year in your facilities. Low-ambient conditions: These units will maintain their full cooling capacity — or more — from 131°F (55°C) down to 32°F (0°C) without any modifications, and to as low as -40°F/C with adaptation. As ambient temperatures fall, the capacity of these air conditioners increases by up to 20-25% above their rated capacities at standard rating temperatures of 95°F (35°C). Even at 120°F (49°C), they will provide substantially more cooling than their rated capacity. Thermostats in Aero Conditioner Company air conditioners can be adjusted to maintain temperatures inside the cooled space as high as 105°F (41°C) to 110°F (43°C). Therefore, if your building merely needs to be kept from overheating, our air conditioners can substantially reduce your energy costs by cooling only when solvents, explosives, other products, controls or equipment actually need cooling and not force your system to run cooler than necessary. In fact, you may be able to utilize a smaller-capacity air conditioner because you will not need to operate it at lower temperatures. A high room temperature will also increase the life of the air conditioner. 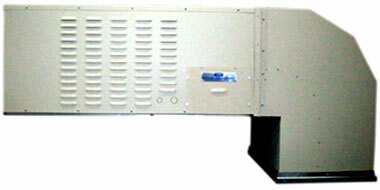 Roof-mount air conditioners include a plenum that passes through the roof/ceiling of the conditioned space. Since the thickness of roofs varies, Aero Conditioner Company allows for a significant variation of thickness. However if the length is not great enough, as an option we can increase that length. The section of the air conditioner mounted on the roof allows both top and side access to facilitate maintenance and repairs. Aero Conditioner Company normally provides for the power connection to be made directly to the roof-mounted section; however, as an option, we can provide cabling for a connection inside the space.